It's been awhile since DDC has brought you his Friday Gameday and for good reason. 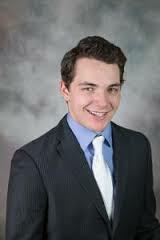 This blogger is happy to announce to the college hockey world that DDC baby No. 2, a happy and healthy, 8 lb, 6 oz boy, was born on March 1st. DDC has had the opportunity over the past week to reflect on the roller coaster ride that has been this march to baby No. 2 and as he always does, he's found a way to compare it to his beloved UND men's hockey team. Baby DDC No. 1's emergence into the world feels much like last year's NCAA championship run -- smooth sailing. Mrs. DDC had an easy pregnancy with a few minor hiccups (think last year's Frozen Faceoff), but ultimately, but the ride was a fairly easy one. Baby DDC No. 2, much like this year's version of the Green and White, has been a bit more unpredictable. It started with a happy start and finding out that this baby was a boy (think UND's 5-0 start). Then came the morning sickness, food aversions and much less comfortable sleeping for Mrs. DDC than with baby No. 1 (think the Green and White's injuries, inconsistent play, games they dominated, but still lost). With all of this considered, Baby No. 2 came into the world a happy camper and his first week in the world has found him on the right track. Seamlessly, with a sweep last week at Miami, much like DDC Baby No. 2, UND is right where they wanted to be at the start of the year (or their life), at home for the first round of the National Collegiate Hockey Conference playoffs with control of their own destiny to make the NCAA tournament for the 15th-straight year. North Dakota, the No. 4 seed in the NCHC tournament, hosts St. Cloud State this weekend in a pivotal best 2-of-3 series that with a win will advance them to the Frozen Faceoff next weekend in Minneapolis and should see UND make the national tournament. However, a series loss may burst the Green and White's bubble. For SCSU, it's do-or-die, as well. They'll need a big run in the NCHC tournament to make the dance. So, what'll it be for UND? Lots of spit up and no sleep and a long summer at home or a happy tummy and restful nights en route to the tournament? Wait, sorry, baby confusion... actually, that analogy seems to work, so let's go with that. Here's what to watch for in DDC's "Who? What? How?" breakdown of a crucial first-round NCHC series in Grand Forks with a trip to the Target Center on the line. leads the Huskies with 29 points. So. F, Mikey Eyssimont, 14 goals, 15 assists -- 29 points; Jr. F, Blake Winiecki, 12g, 11a -- 23 pts; So. F, Patrick Newell, 3g, 20a -- 23 pts; Fr. D, Jack Ahcan, 5g, 16a -- 21 pts; So. F, Jacob Benson, 10g, 10a -- 20 pts; So. G, Jeff Smith, 10-11-0, 2.58 goals against average, .910 save percentage. So. F, Shane Gersich, 19g, 15a -- 34 pts; Fr. F, Tyson Jost, 14g, 15a -- 29 pts; So. F, Brock Boeser, 13g, 15a -- 28 pts; Jr. D, Tucker Poolman, 7g, 21a -- 28 pts; Jr. F, Austin Poganski, 9g, 12a -- 21 pts; Jr. G, Cam Johnson, 17-11-3, 2.34 GAA, .905 SV PCT. The Huskies are tied for 31st in both scoring and goals allowed with 2.88 goals per game for and 2.88 goals per game against. St. Cloud State commits the least amount of penalty minutes per game in the NCAA, averaging just 9.1 and are 21st in the country in penalty kill at 83.9%. Sophomore forward Jacob Benson and Freshman defenseman Jon Lizotte are Grand Forks natives. UND is 23rd in the NCAA in goals per game (3.11) and 19th in goals allowed (2.54). The Green and White lead the NCHC in penalty kill and are 15th nationally, killing 84.6% of the opposition's power plays. Freshman forward Tyson Jost is 6th in the NCAA in rookie scoring, notching 1.04 points per game and is tied for 5th in rookie goals (14). Jost was named to the NCHC all-rookie team and Junior defensman Tucker Poolman was named all-NCHC first team. Sophomore forward Shane Gersich was tabbed as an honorable mention. No. 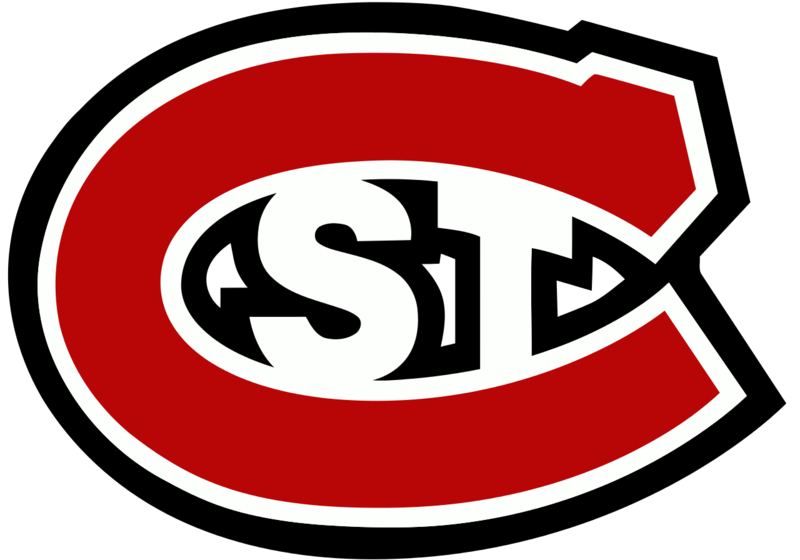 20 SCSU (PWR: 18, 16-17-1; 10-13-1 – 31 points, 5th Seed for NCHC tournament) split at home against Colorado College, winning 5-2 on Friday and losing 201 on Saturday. The Huskies have lost 3 of their last 4. No. 14 UND (PWR: 12, 18-14-3; 11-12-1-1 – 35 points, 4th Seed for NCHC tournament) swept Miami last weekend in Oxford, Ohio, 3-2 and 5-2 . The sweep clinched home ice for the first round of the conference tournament for the 15th-straight season for the Green and White. The Green and White won 3-of-4 against the Huskies this season, sweeping SCSU in St. Cloud in November and splitting in Grand Forks in February. weekend against SCSU in a first-round NCHC tournament series at home. So much on the line. After all the ups-and-downs this season has brought, UND fully controls its destiny this weekend in Grand Forks. The same can be said for the Huskies, however. They can certainly find their way into the NCAA tournament and that run starts at the Ralph Engelstad Arena for them, as well. For long stretches of this season, North Dakota has been inconsistent. In the same weekend, on many occasions, they've shown the ability to be a true contender in their pursuit of a back-to-back title run and then the next night, shown up as a team that wouldn't make the tournament. After a dominant weekend in Oxford that saw UND sweep and hold Miami to just 27 shots on the weekend (including a season-low allowed 11 on Saturday), the Green and White have put themselves into position to make a run. Which team shows up this weekend? UND had a couple of key injuries to note from last weekend as sophomore Brock Boeser did not play in the series and junior Austin Poganski exited Saturday's game. While Poganski is expected to play this weekend, Boeser, arguably North Dakota's best player, is questionable. St. Cloud State will be without sophomore defenseman Will Borgen for two games after an incident with an official last weekend and senior defenseman Niklas Nevalainen is also a question mark due to injury. Much like Baby DDC No. 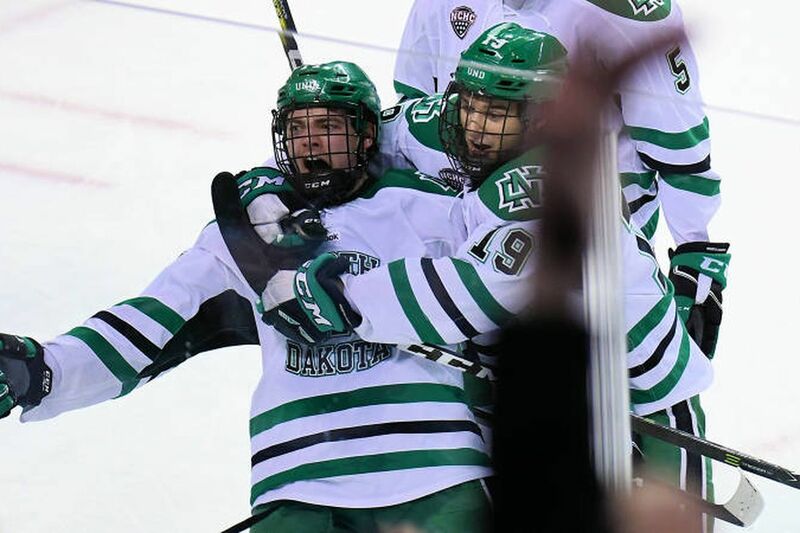 2's run into the world, DDC sees this weekend as roller coaster for UND. All things considered, the Green and White are a little bit better than the Huskies and ultimately, DDC thinks UND will prevail. However, SCSU has a lot to play for, too and certainly won't go quietly. Tyson Jost needs to keep being the dynamic rookie he's been all season and UND desperately needs their third and fourth lines to keep scoring like they have of late. Junior Trevor Olson netted both game-winning goals at Miami last weekend and sophomore Chris Wilkie scored his first of the year on Saturday. If Boeser is back in the lineup, the top line of Boeser, Jost and Gersich have shown a streak of dominance. With that line in tact, secondary scoring would be massive. Expect this one to go three and UND fans around the world have to sweat it out on Sunday, but see their team march on to Minneapolis and the Frozen Faceoff. UND WINS IN THREE, WINNING 4-2 ON FRIDAY, FALLING 3-2 ON SATURDAY AND MOVING ON TO THE TARGET CENTER WITH A 5-2 WIN ON SUNDAY. There you have it, hockey fans. Hopefully DDC will bring you good news after this weekend. Thanks for reading and enjoy the series! Labels: Brock Boeser, college hockey, DDC baby No. 2, Mikey Eyssimont, nchc playoffs, St. Cloud State, Tyson Jost, UND men's hockey, Who? What? How?